I'm so glad I live by my friend Michelle, we like to help each other out. One thing we do is watch each others kids. She needs a babysitter while she's in class and I need a babysitter when I go to work, so we just help each other out for free. If you have a friend or neighbor you can do this with you can save lots of money by not paying for babysitters. I've even heard of babysitting co-ops where a group of people take turns babysitting everyone's kids so the other couples can get a night off. 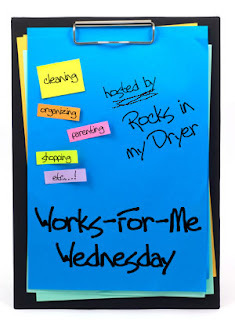 Check out Rocks In My Dryer for more WFMW tips! Clean up in Aisle 2! Win a Philips Digital Photo Frame!